Farewell to Wembley Stadium, 2000. 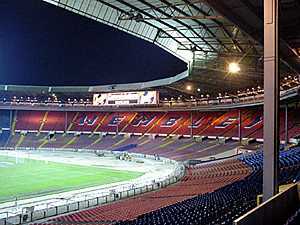 The last weeks of the World's most famous football stadium, October 2000. After many years of indecision and failed planning applications, Wembley's due to be completely demolished and replaced with a swanky new stadium. I was invited to one of the last ever games to be played there, a charity England v Scotland match, watched by a diminutive crowd of under 300. Bizarrely, a soundtrack of a huge crowd noises was blasted through the Tannoy as the assembled collection of the vaguely famous (Sean Bean), fading footballers (David Pleat), obscure bands (Atomic Kitten) and 'D' list 'celebs' battled on the muddy remnants of the pitch. 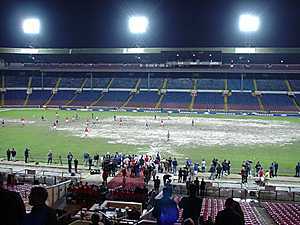 All around the ground were reminders of its impending demise: billboards were taken down, much of the grass behind the goals had been taken up and what turf was left was in a terrible state. After a fairly amusing match, Scotland won 3-2 and I grabbed a quick picture as the stadium emptied out. It sure felt strange being present at the death of a stadium that has seen so many incredible victories - the greatest of all being Cardiff City beating Arsenal 1-0 waaaaay back in 1927! Thankfully, the party afterwards was outstanding so my final memory of this famous stadium is one of blissful drunkeness!